ICHSEA 2019 Organizing Committee will run in conjunction with the conference program. The exhibition has been designed to provide the optimal promotional opportunities to participating companies and organizations. The exhibition creates unparalleled opportunity to promote your products and services face-to-face to attending delegates. To secure your booking and to ensure you gain the best possible promotional location, please contact the secretariat at secretariat@ichsea2019.org now. The allotment of booths will be on first come, first served basis. However, ICHSEA 2019 organizing committee reserves the right to rearrange or relocate the location of booths based on the actual number of booths sold. Side and Rear Walls: White printed papers or painted panels 2m length * 2m width * 2.5m height set in an aluminum framework. Fascia: Fascia board, 0.3m wide, set at a height of 2.2m to the underside; will be placed on each open frontage. 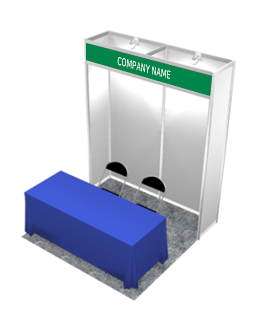 Information Desk and Chair Set: One set of information desk and folding chair is available for the exhibitor. The size of the desk is 1m length * 0.5m width * 0.75m height. Copyright (c) ICHSEA 2019 All Rights Reserved.